Why choose the DX-D 800*? A solution that offers general radiography, fluoroscopy and can perform free exposures using a single detachable, tethered detector? 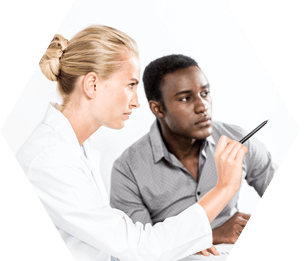 That requires only one investment to deliver a broad range of applications encompassing all types of examinations and negating the need for additional specialist rooms? That delivers powerful image processing that affords superb image quality and a more efficient workflow? That’s the DX-D 800 from Agfa. 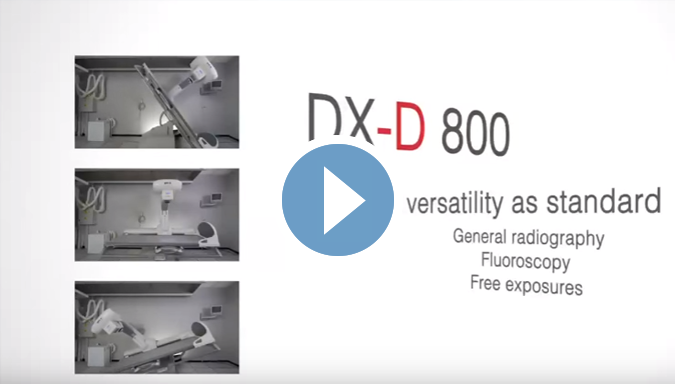 Comprising a wide range of features that combines unrivalled positioning freedom with workflow improvements, the DX-D 800 delivers outstanding patient and operator comfort whilst maximizing your return on investment. Equipped with the latest generation Flat Panel Detector (FPD), it offers a highly versatile fully integrated digital imaging three-in-one solution. Capable of handling patient loads of up to 230 kg (500lbs), the DX-D 800’s motorized table height adjustment and low minimum height capability simplifies access for patients with mobility issues and ensures operator comfort too. Clear access to a 120 cm section enables patients to be transferred effortlessly from a trolley or bed. A single push of the ‘Move’ button positions the table for the selected procedure and ensures that the system is ready for immediate imaging. The table’s capacity for varied height settings further enhances its mobility, allowing it to be adjusted to exactly the right height for your comfort while standing examinations are performed. Together, these features allow you to undertake the most logistically challenging exams while delivering maximum comfort for you and your patient. The DX-D 800’s single flat panel detector, comprising the latest CsI detector technology offering dose reduction potential, measures 35×43 cm and can be used both in and outside the table. Detached easily by disconnecting a single cable, the DR detector can also be positioned conveniently outside the table for free exposures. The detector’s acquisition rate of up to 30 frames per second makes the solution suitable for the most demanding fluoroscopic applications and provides automatic processing and instant imaging with fast image display. Available at an attractive price, it offers great exam versatility when used both inside the table and for external free exposures. The DX-D 800’s innovative integrated video camera’s visual positioning capabilities allow the fi eld of view to be adjusted without the use of radiation before the main exposure. This radiation-free positioning reduces exam times and results in reduced patient dose. 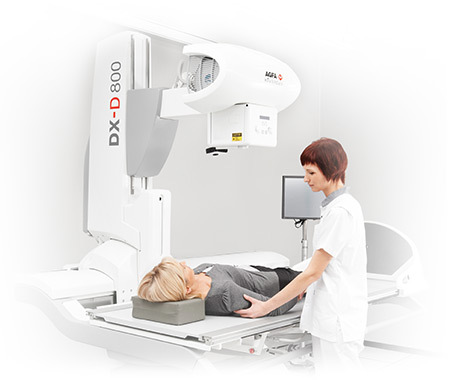 The DX-D 800’s 180cm Source Image Distance (SID) provides the versatility to perform all imaging procedures including uncompromised chest imaging. Its rotation feature makes it highly suitable for off-table exposures as it can be positioned to facilitate standing and other diffi cult exams. Motorized tube column angulation, combined with manual tube rotation, provides end-to-end table-top coverage, enabling examinations of extremities to be performed without restriction. An ideal solution for trolley exposures, it alleviates the need for ancillary room equipment. For studies comprising full leg/full spine imaging, the DX-D 800’s positioning of the tube and detector, erect and supine imaging capability, its acquisition of up to four images, and seamless automatic stitching are all fully automated as standard. An enhanced package with more extended high level positioning measurement functionalities and extensive orthopaedic tools is also available.